There’s some great reading up at the SCOSS web site, but I don’t recommend it for bedtime. The SCOSS Alert “Effects of Scale” published late last year, discusses what happens when reality doesn’t match simplified structural models, and the answers range from not pretty to potentially catastrophic. In short, engineers don’t analyze buildings, we analyze models which are simplified versions of reality. Thanks to computers we can make the models more complex than was common in the past, but there’s a point info diminishing returns: we don’t have the time or information to make models that represent the final constructed object in all its detail. Too many details are out of our control – decided by the fabricators and erectors, or by contractors in trades completely unrelated to structure – for us to pretend we know it all. In 1986 I was at a Mets playoff game when people started performing the wave and jumping up and down as they rose and sat in unison. It is unnerving, to say the least, to see the steel-and-concrete upper deck of a full-size baseball stadium visible swaying under the load of people cheering their team. This is one of the best examples of the title of the alert: short-span beams suffer little from dynamic loading, while large structure do. The core of the alert’s discussion of long-span beams concerns the difference between actual end connections and the types of end connections we model in analysis (pin ended, fixed ended, a set rotation/load curve, etc.). The actual structure is not exactly any of those models, and with long beams supporting heavy loads, the inaccuracy can significantly change the results. Beam design typically ignores both accidental out-of-straight conditions and the deflection that inevitably happens when you apply load. This can lead, as described in the alert, to all sorts of second-order effects like ponding, variable slab thickness, and visibly out-of-flat floors. We’ve examined buildings where distress in the curtain wall was related to structural movement. The walls and the frame are two separate systems and usually designed separately; the results can be long-term facade damage and unexpected overall structural movement. Live loads are not usually a problem in our practice, since old buildings were usually designed for heavier loads than modern codes specify for the same occupancies, but changes can add load. The construction of a new high-rise next door may create snow drifts where none previously existed, something that is impossible to take into account in the original design. “Temperature effects are traditionally ignored in routine design.” At my first job, I was surprised that there was a second round of slab design on a concrete-frame building, to take into account secondary stresses from the exterior columns and spandrel beams moving with changing temperatures as the interior structure stayed still. The amount of stress created by the temperature swings was impressive. The concept of gestalt applies to buildings. The way one piece structure reacts to its environment can’t be considered in isolation to the rest of the building (as in my examples in 4 and 6) but that’s how a lot of it is designed. Given the amount of work that goes into investigating and repairing curtain-wall failures triggered by structural interaction, I think it’s fair to say that the issue of how best to integrate architectural finishes and large structural frames is still an open question. Any time a piece of structure is out of scale to that commonly used, it is less well understood and it potentially is a more likely failure point. More and smaller bolts, for example, provide a more reliable connection than bigger and fewer. Structural failures of any kind, including collapses and non-threatening damage to minor architectural elements, are rarely caused by mistakes in design calculations. They are far more often caused by the kind of interaction effects described in the SCOSS alert. 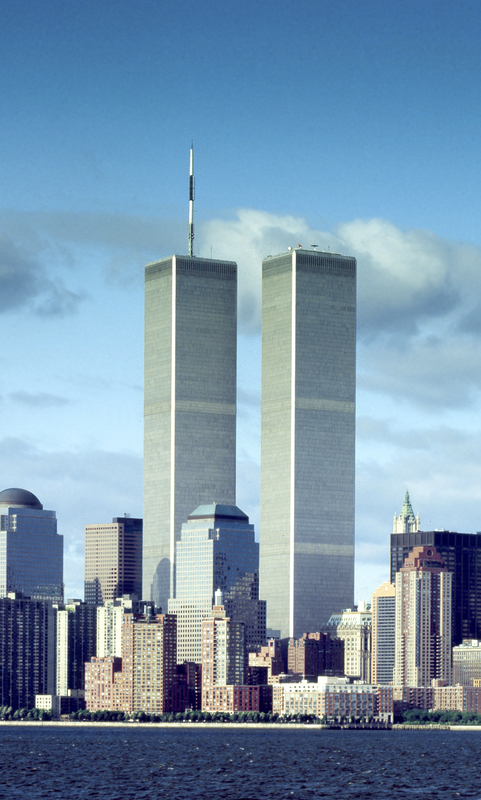 The original World Trade Center towers, shown above, were excessively flexible in high winds. They were not flexible enough to suffer structural or curtain-wall damage, but there was the potential that the elevators would jam in their tracks from misalignment caused by wind sideway. On at least two occasions, the upper floors were closed during potential high-wind storms to make sure that people didn’t end up stuck 300m up without elevators to come down. I have one quibble with the alert, related to my comment about the WTC: on the first page it gives the Empire State Building as an example of an early skyscraper that “swayed enough to cause discomfort to occupants.” I’m not aware of that problem with the ESB. Noticeable sway generally became a problem with the post-WWII generation of tall. buildings, particularly the ones built in the late 1960s and early 1970s, when design for dynamic effects and drift was still primitive compared to the analysis performed today, but the buildings became much lighter from the elimination of masonry curtain walls and interior partitions.